I adored All These Things I've Done, the first book in this series. Zevin created a world of strategy and gang politics that drew me in completely. The loose ends (mostly Win) had me dying for a sequel. 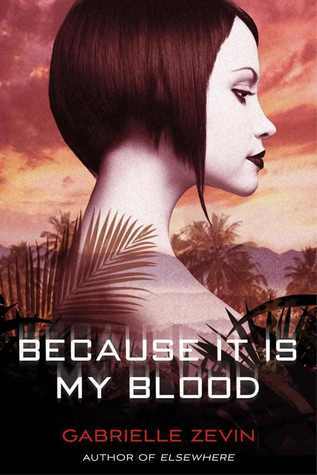 While the cover for Because It Is My Blood disappointed me, the story claimed my attention from the first page onward. Zevin tones down the romance quite a bit in this second book. Instead, she focuses more on Anya's family politics. While I missed the adorable Win, it was interesting to watch Anya become more deeply involved with the chocolate black market. Who can she truly trust in a family of criminals? Who is trying to protect her and who is trying to manipulate her? The one thing I disliked about this sequel was the ending. I can't even put my thumb on what I disliked. Something about Anya's final decision just rubbed me wrong. I can't see how it will play out well in the following book. However, I am still looking forward to more tales of the Balachines. I'm also keeping my fingers crossed that we'll see a little more romance between Anya and Win. Once again, Zevin has impressed me with her ability to combine organized crime with a futuristic Manhattan. Because It Is My Blood resolves many of the unanswered questions from the first book while delving deeper into Anya's world of mistrust. It's definitely a must read for lovers of the first book. Congrats to Zevin for a successful sequel!